Carbohydrates are one of the main types of nutrients. They are the most important source of energy for your body. Your digestive system changes carbohydrates into glucose (blood sugar). Your body uses this sugar for energy for your cells, tissues and organs. It stores any extra sugar in your liver and muscles for when it is needed. Carbohydrates are called simple or complex, depending on their chemical structure. Simple carbohydrates include sugars found naturally in foods such as fruits, vegetables, milk, and milk products. They also include sugars added during food processing and refining. 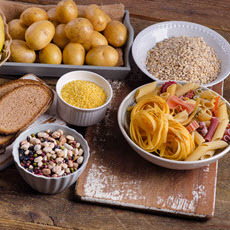 Complex carbohydrates include whole grain breads and cereals, starchy vegetables and legumes. Many of the complex carbohydrates are good sources of fiber. For a healthy diet, limit the amount of added sugar that you eat and choose whole grains over refined grains. Article: Tobacco industry involvement in children's sugary drinks market.